Our analysis reveals the high cost caused by pollution from power stations and other large industrial plants. The estimated costs are calculated using the emissions reported by the facilities themselves. By using existing tools employed by policy-makers to estimate harm to health and the environment, we revealed some of the hidden costs of pollution. We cannot afford to ignore these issues. 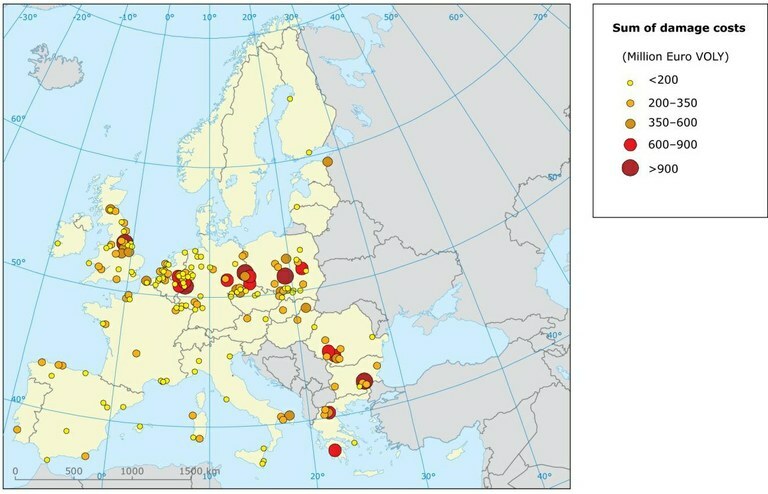 The report, 'Revealing the costs of air pollution from industrial facilities in Europe', provides a list of the individual facilities that contribute the most harm. “Our analysis reveals the high cost caused by pollution from power stations and other large industrial plants,” Professor Jacqueline McGlade, EEA Executive Director, said. “The estimated costs are calculated using the emissions reported by the facilities themselves. By using existing tools employed by policy-makers to estimate harm to health and the environment, we revealed some of the hidden costs of pollution. We cannot afford to ignore these issues”, added Professor McGlade. The industrial facilities covered by the analysis include large power plants, refineries, manufacturing combustion and industrial processes, waste and certain agricultural activities. Emissions from power plants contributed the largest share of the damage costs (estimated at €66–112 billion). Other significant contributions to the overall damage costs came from production processes (€23–28 billion) and manufacturing combustion (€8–21 billion). Sectors excluded from the EEA analysis include transport, households and most agricultural activities – if these were included the cost of pollution would be even higher. Air pollution by the facilities covered by EEA’s analysis cost every European citizen approximately € 200-330 on average in 2009. Countries such as Germany, Poland, the United Kingdom, France and Italy, where a high number of large facilities are located, contribute the most to the total damage costs. However, when damage costs are weighted in an attempt to reflect the productivity of national economies, the ordering of countries changes significantly. The emissions from countries such as Bulgaria, Romania, Estonia, Poland and the Czech Republic are then relatively more important with regard to the damage costs. 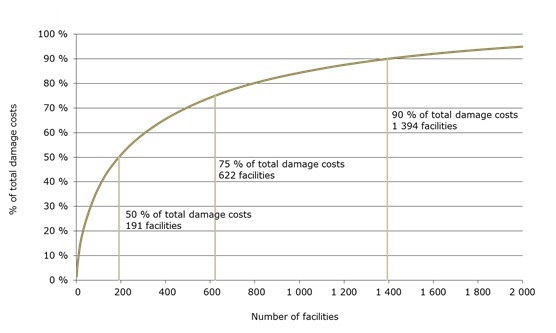 A small number of individual facilities cause the majority of damage costs. Three quarters of the total damage costs were caused by the emissions from just 622 industrial facilities – 6 % of the total number. The facilities with emissions associated with a high damage cost are in most cases some of the largest facilities in Europe which release the greatest amount of pollutants. Carbon dioxide (CO2) emissions contribute the most to the overall damage costs, approximately €63 billion in 2009. Air pollutants, which contribute to acid rain and can cause respiratory problems - sulphur dioxide (SO2), ammonia (NH3), particulate matter (PM10) and nitrogen oxides (NOx) - were found to cause €38-105 billion of damage a year. The report uses publicly-available data from the European Pollutant Release and Transfer Register (E-PRTR). The analysis builds on existing policy tools and methods, such as the methods developed under the EU’s Clean Air for Europe (CAFE) programme. Based on the different methodologies, it calculates a range of estimated damage costs arising from air pollutant releases reported by nearly 10 000 individual facilities to the E‑PRTR. The pollutants examined are regional air pollutants (NH3, NOx, PM10, SO2, volatile organic compounds (NMVOCs)), heavy metals (arsenic, cadmium, chromium, lead, mercury and nickel), organic micropollutants (benzene, polycyclic aromatic hydrocarbons (PAHs) and dioxins & furans), and CO2. Certain aspects of harm to health and the environment are excluded from the scope of this study, such as the health and safety aspects associated with occupational exposure to air pollutants. For regional air pollutants for example, the model framework underpinning the assessment should be extended in the future to include aspects such as a valuation of ecological impacts and acid damage to culturally significant buildings and monuments. The recognised benefits of industrial facilities, including manufacturing products, employment and tax revenues, are not addressed in the report. It is important to note that the report does not assess whether the emissions from industrial facilities included in the E-PRTR are consistent with the legal permitting conditions for the operation of these plants. ‘Air pollution impacts from carbon capture and storage (CCS)’, assessing the potential impacts on air pollutants from the introduction of CCS in Europe. Air pollution impacts from carbon capture and storage (CCS) Carbon Capture and Storage (CCS) consists of the capture of carbon dioxide (CO2) from power plants and/or CO2-intensive industries such as refineries, cement, iron and steel, its subsequent transport to a storage site, and finally its injection into a suitable underground geological formation for the purposes of permanent storage. It is considered to be one of the medium term 'bridging technologies' in the portfolio of available mitigation actions for stabilising concentrations of atmospheric CO2, the main greenhouse gas (GHG). Assessing the costs of air pollution Air emissions expert Martin Adams explains the main findings of our report, 'Revealing the cost of air pollution'. For references, please go to https://www.eea.europa.eu/media/newsreleases/industrial-air-pollution-cost-europe or scan the QR code.